Background: Effective control of tuberculosis is achieved by early diagnosis and drug susceptibility testing for initiation of appropriate treatment. The performance of crystal violet decolorization assay (CVDA) for susceptibility testing of Mycobacterium tuberculosis to isoniazid (INH) and rifampicin (RIF) was compared in a multicenter study. Methods: Seventy-two M. tuberculosis isolates were tested in two phases by CVDA. Results: In Phase I, the specificity, sensitivity, positive predictive value (PPV), negative predictive value (NPV), and agreement for INH were 100%, respectively. Specificity, sensitivity, PPV, NPV, and agreement for RIF were 98.2%, 100%, 94.1%, 100%, and 98.6%, respectively. In Phase II, specificity, sensitivity, PPV, NPV, and agreement were 98%, 100%, 95.4%, 100%, and 98.6% for INH, respectively. Specificity, sensitivity, PPV, NPV, and agreement for RIF were 96.3%, 88.2%, 88.2%, 96.3%, and 94.4%, respectively. Results in the study were obtained on average 10.9 ± 3.1 days in Phase I and 9.8 ± 2.2 days in Phase II. Conclusion: CVDA can be performed for drug susceptibility testing in developed and developing countries. In addition, further studies with larger sample size are needed for evaluation of this method. Tuberculosis (TB) is still one of the most important infectious diseases in the world. Effective control of TB is achieved by early diagnosis and drug susceptibility testing for initiation of appropriate treatment. Following streptomycin (STR) introduction as an anti-TB agent in the late 1940s, drug-resistant Mycobacterium tuberculosis was reported in a very short time. Even drug-resistant TB was not taken into consideration until multidrug-resistant-TB (MDR-TB) showed a big explosion in the USA and Europe 1990s. MDR-TB is defined as TB resistant at least to both isoniazid (INH) and rifampicin (RIF). MDR-TB compared drug-susceptible TB is a global health threat results from treatment and diagnosis difficulties. Accurate and rapid diagnosis of drug-resistance TB can provide early initiation of effective treatment and therefore reduce the spread of drug resistance and improve healing rate. Early and rapid diagnosis of TB and MDR-TB is a global priority. Colorimetric assays are based on the principle of color change of the indicator dye added to antibiotic-containing and antibiotic-free medium. M. tuberculosis bacilli change the color of medium by metabolizing the dye during growth. When compared with conventional antibiotic susceptibility testing, these assays give rapid and reliable results for detecting resistance. 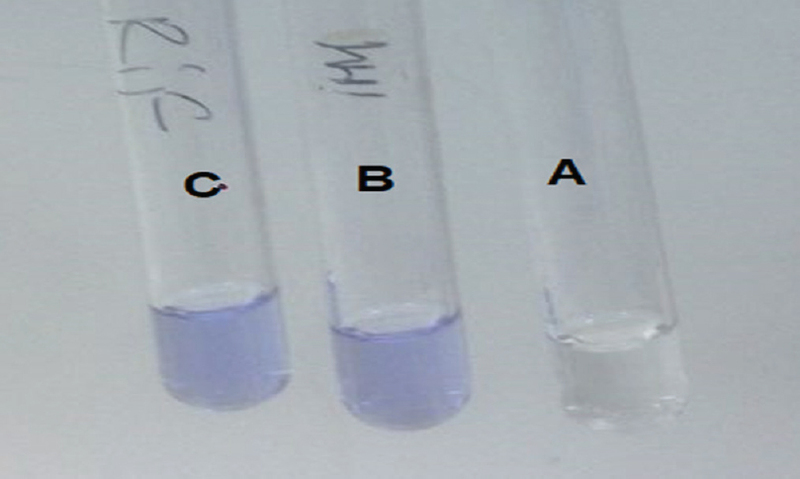 One of these tests is the crystal violet decolorization assay (CVDA) based on the loss of color due to the reduction and sequestering the dye by living bacilli in the medium. In this multicenter study, we compared the performance of CVDA for susceptibility testing of M. tuberculosis to INH and RIF. The study was performed in 4 centers. A total of 24 isolates (19 clinical isolates and 5 standard strains) were tested at C1. Only one of these isolates was resistant to INH. All isolates were sensitive to RIF. In addition, five reference strains were used as controls in C1. In C2, 20 isolates were tested, including 6 multidrug resistant (MDR), 2 INH resistant, and 11 INH and RIF susceptible isolates. One isolate excluded from the study due to contamination. A total of 21 isolates and the reference strain H37Rv were tested in C3. One INH resistant and 1 RIF resistant isolate were excluded from the study due to lack of growth and a total of 19 isolates including 8 MDR, 1 INH resistant, and 10 susceptible isolates were evaluated. In the C4, 2 MDR isolates, 1 INH resistant isolate, 6 susceptible isolates, and H37Rv reference strain were tested. This multicenter study consisted of two phases (Phase I and II). The reference test method was Bactec Mycobacteria Growth Indicator Tube (MGIT) 960 in all centers. Ethical approval was not required for the study. In Phase I, all tubes were prepared as previously described. Briefly, after preparation, 1 mL of 7H9S broth was dispensed into screw cap tubes. For each isolates, 3 tubes (tube 1; 0.125 μg/mL INH, tube 2; 0.50 μg/mL RIF and tube 3; growth control) were used. All tubes were stored at +4°C until use (not exceed 1 month). All tests were performed in 96-well microtiter plates. All wells were filled with 0.1 mL of Middlebrook 7H9S broth. Antibiotic test concentrations were prepared by the serial two-fold dilution. Seven dilutions of each antibiotic and a growth control well were prepared for each isolate. The antibiotics concentrations were 2.00–0.03 μg/mL for INH and RIF, except C3 (2.00–0.06 μg/mL). All prepared microtiter plates were stored at −80°C until use. Phase I: An INH test tube (0.125 μg/mL), a RIF test tube (0.50 μg/mL), and a drug-free growth control tube were used for each isolate. Fifty microliters of a bacterial suspension (McFarland no 1) was inoculated into the three tubes and the tubes were be incubated at 37°C. 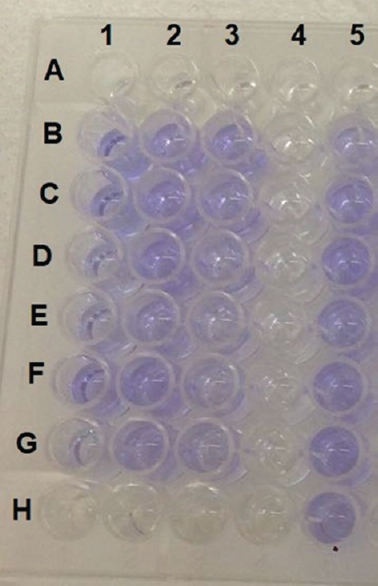 On the 5th or 7th day of incubation, 100 μl of CV stock solution (25.0 μg/mL) was then added to all tubes and incubated for an additional 24–48 h. As CV (blue/purple) was decolorized by the growth of bacteria, the isolates were considered to be resistant to that drug if the color of CV was lost. If a color did not decolorize in the growth control tube, incubation was prolonged until decolorization [Figure 1]. Decolorization was measured the complete disappearance of blue color. Phase II: The bacterial suspension (McFarland no 1) was diluted at a 1:10 ratio and 100 μl of bacterial suspension was inoculated into each well. After bacterial inoculation, all plates were incubated at 37°C. On the 5th or 7th day of incubation, 25.0 μL of CV stock solution (25.0 mg/L) was added into all wells. After that incubation was continued until decolorization in the growth control well. Minimum inhibitory concentration (MIC) was defined as the lowest drug concentration without decolorization. If the MIC value was over the breakpoint value, the isolate was considered to be resistant to tested antibiotic [Figure 2]. Breakpoints values were 0.125 and 0.5 μg/mL for INH and RIF, respectively. C1: A total of 24 M. tuberculosis isolates were tested, including five reference strains and 19 clinical isolates. Tested reference strains of M. tuberculosis were ATCC 35822 (INH resistant), ATCC 35838 (RIF resistant), ATCC 35820 (STR resistant), ATCC 35837 (ethambutol [ETM] resistant), and H37Rv (susceptible to anti-TB drugs). Susceptibility testing of the isolates with primary anti-TB drugs was performed by Bactec MGIT 960 as reference method, and one of these clinical isolates was resistant to INH, and the remaining 18 isolates were susceptible to INH and RIF. In Phase I, ATCC 35822 M. tuberculosis and one clinical isolate were resistant to INH by both CVDA and reference method. Others were identified susceptible to INH and RIF by both methods. The results were obtained on average of 10 ± 0.78 days (9–11 days). In Phase II, MIC values of INH in ATCC 35838, ATCC 35820, ATCC 35837, and H37Rv reference strains were ≤0.03 μg/mL; MIC of ATCC 35822 strain was ≥2.00 μg/mL. MIC values were determined ≤0.03 μg/mL in 10 isolates, 0.06 μg/mL in 5 isolates, 0.125 μg/mL in 3 isolates, and ≥2.00 μg/mL in 1 isolate. The MIC value of RIF for ATCC 35822, ATCC 35820, and H37Rv standard strains were 0.06 μg/mL; ≤0.03 μg/mL for ATCC 35837; and ≥2.00 μg/mL for ATCC 35838. The MIC values for RIF were found as ≤0.03 μg/mL for 5 isolates; 0.03 μg/mL for 1 isolate; 0.06 for 5 isolates; and 0.125 μg/mL for 8 isolates. Results were obtained on the 8th day except for the ATCC 35838 strain that was obtained on the 10th day. C2: Although 20 isolates were tested; 1 isolate was excluded from the study due to contamination. Drug susceptibility testing by MGIT 960 showed 6 MDR-TB isolates, 2 resistant to INH, and the remaining 11 isolates were susceptible to both drugs. In Phase I, 11 isolates were susceptible to INH and RIF by both methods. Two isolates were found resistant to INH and susceptible to RIF in two methods. Five out of six MDR isolates were defined MDR by CVDA. One isolate found RIF susceptible by CVDA whereas it was resistant by MGIT 960. The results were obtained on average 10.1 ± 1.32 days (9–13 days). In Phase II, MIC values of INH were ≤0.03 μg/mL for 4 isolates, 0.03 μg/mL for 4 isolates, 0.06 μg/mL for 3 isolates, 0.50 μg/mL for 2 isolates, 1.00 μg/mL for 2 isolates, 2.00 μg/mL for 2 isolates, and ≥2.00 μg/mL for 2 isolates. MIC values of RIF were detected as ≤0.03 μg/mL for 4 isolates, 0.03 μg/mL for 2 isolates, 0.06 μg/mL for 5 isolates, 0.50 μg/mL for 2 isolates, 2.00 μg/mL for 2 isolates, and ≥2.00 μg/mL for 4 isolates. The results were obtained on average 12.05 ± 1.5 days (9–14 days). C3: A total of 21 isolates and the H37Rv reference strain were tested, but decolorization was not observed in two isolates and they were excluded from the study due to lack of growth in Phase I and Phase II. For that reason, 19 isolates were evaluated in the study. In Phase I, 8 MDR isolates, 1 INH resistant isolates, and 10 drug-susceptible isolates were tested. The results obtained by CVDA for INH and RIF were found in full agreement with the reference method MGIT 960. Results were obtained on average 13.8 ± 4.7 days (7–24 days) in the study. In Phase II, MIC value of INH were found ≤0.06 μg/mL for 10 isolates, 0.125 μg/mL for 1 isolate, 0.25 μg/mL for 2 isolates, 0.50 μg/mL for 2 isolates, 1.00 μg/mL for 1 isolate, and ≥2.00 μg/mL for 3 isolates. One isolate was determined as resistant to INH by MGIT 960, whereas it was susceptible by CVDA (MIC value was 0.125 μg/mL). MIC values of RIF were determined as ≤0.06 μg/mL in 11 isolates, 0.50 μg/mL in 2 isolates, 1.00 μg/mL in 2 isolates, and ≥2.00 μg/mL in 4 isolates. Two isolates were found resistant to RIF by MGIT 960, but it was susceptible by CVDA (MIC values were 0.50 μg/mL). Results were obtained on average 10.3 ± 2.74 days (6–13 days). C4: A total of 9 clinical isolates and one standard strain were tested. MGIT 960 was used as reference method for susceptibility testing of all isolates. Two isolates were resistant to both INH and RIF and one isolate was resistant to INH. In Phase I, the results of the tested isolates were concordant for INH and RIF. Two isolates were resistant to INH and RIF and one isolate was resistant only to INH by CVDA and MGIT 960. The other 6 isolates were susceptible to both drugs. In Phase I, results were obtained on the 9th day. In Phase II, MIC values of INH were 0.015 μg/mL for 5 isolates, 0.03 μg/mL for 2 isolates, 1.00 μg/mL for 2 isolates, and 2.00 μg/mL for 1 isolate. All results were concordant with MGIT 960. MIC values of RIF were 0.015 μg/mL for 1 isolate, 0.06 μg/mL for 1 isolate, 0.125 μg/mL for 2 isolates, 0.25 μg/mL for 1 isolate, 0.50 μg/mL for 1 isolate, 1.00 μg/mL for 2 isolates, 2.00 μg/mL for 1 isolate, and ≥2.00 μg/mL for 1 isolate. Two isolates were susceptible by MGIT 960, whereas they were determined as resistant by CVDA (MIC values were 1.00 and 2.00 μg/mL). In Phase II, results were obtained on the 9th day. In Phase I, the specificity, sensitivity, positive predictive value (PPV), negative predictive value (NPV), and agreement for INH were 100%, whereas they were 98.1%, 100%, 94.4%, 100%, and 98.6% for RIF, respectively [Table 1]. In Phase II, specificity, sensitivity, PPV, NPV, and agreement for INH were 98%, 100%, 95.4%, 100%, and 98.6%, whereas they were 96.3%, 88.2%, 88.2%, 96.3%, and 94.4%, for RIF, respectively [Table 2]. Results were obtained on average 10.9 ± 3.1 days in Phase I and 9.8 ± 2.2 days in Phase II. Especially in low- and middle-income countries, TB is still a major infectious disease with high morbidity and mortality. In recent years, an increase in the prevalence of multidrug and extensively drug-resistant TB has complicated TB control. Accurate, reliable, and rapid culture and susceptibility testing are prerequisites for a successful treatment regimen. Rapid detection of drug susceptibility acts as an important factor to prevent the spread of resistant isolates. The first study of CVDA for antibiotic susceptibility testing was performed in 2014 by Coban and has been validated for INH and RIF susceptibility testing. The sensitivity, specificity, PPV, and NPV for INH were 92.5%, 96.4%, 96.1%, 93.1%, and 94.5% whereas they were 88.8%, 100%, 100%, 94.8%, and 96.3% for RIF, respectively. The results were obtained within 8–9 days. The study concluded that CVDA was a rapid, simple, and inexpensive method for detection M. tuberculosis INH and RIF resistance in developing countries. Coban et al. comparatively evaluated REMA, MGDA, microplate NRA, and CVDA for the rapid detection of MDR-TB. Specificity, sensitivity, PPV, NPV, and agreement were 100%, 95%, 100%, 96.7%, and 98% for the INH and 100%, 94.1%, 100%, 97%, and 98% for RIF, respectively. Coban et al. evaluated the CVDA to determine the MIC of primary anti-TB drugs. It was reported that sensitivity, specificity, PPV, NPV, and agreement were 96.3%, 100%, 100%, 96.3%, and 98.1% for INH; 91.3%, 100%, 100%, 93.7% and 96.2% for STM; and 100%, 97.6%, 90.9%, 100%, 98.1% for EMB, respectively. Moreover, all were 100% for RIF. The total agreement for the four antibiotics was obtained 98.1% and mean time to obtain the results was 9.5 ± 0.89 days. Recently, 11 centers participated in a multicenter study. This study was performed in two phases. In Phase I, Center 1 prepared the test tubes containing INH and RIF and drug-free growth control tubes. These tubes were sent to all centers for performing drug susceptibility testing. The centers inoculated the bacteria into the tubes according to test procedure, and subsequently, they sent the tested bacteria to Center 1. The isolates were again tested with the same procedure in Center 1. Agreements were 96.2%–96.8% for INH and 98.1%–98.7% for RIF in the Phase I and II, respectively. Mean time to obtain the results was 14.3 ± 5.4 days in Phase I and 11.6 ± 3.5 days in Phase II. The study concluded that CVDA is a rapid, safe, and inexpensive method and could be used for rapid detection of MDR-TB. In addition, it was emphasized that it could be adapted for drug susceptibility testing in developed and developing countries. Multicenter study, especially in the determination of the reproducibility and reliability of the newly developed methods, has great importance. Especially, if the results of all centers are defined as the same or very close, they provide important information regarding the reliability and application of the method. This is the second multicenter study since CVDA was developed. Coban et al. performed the first study and the agreements were generally above 90% in the study. This study is a multicenter international study, in which the four centers participated in. The agreements were found to be over 90%. In this study, agreements were determined 100% for INH and 98.6% for RIF in Phase I. In Phase II, agreements were 98.6% for INH and 94.4% for RIF, respectively. CVDA is a rapid, safe, inexpensive, and repeatable method. This method can be performed for susceptibility testing in developed and developing countries. However, further studies are needed with more centers and isolates. Coban AY, Akbal AU, Bicmen C, Albay A, Sig AK, Uzun M, et al. Multicenter evaluation of crystal violet decolorization assay (CVDA) for rapid detection of isoniazid and rifampicin resistance in Mycobacterium tuberculosis. Sci Rep 2016;6:39050. Dean AS, Cox H, Zignol M. Epidemiology of drug-resistant tuberculosis. Adv Exp Med Biol 2017;1019:209-20. Boyd R, Ford N, Padgen P, Cox H. Time to treatment for rifampicin-resistant tuberculosis: Systematic review and meta-analysis. Int J Tuberc Lung Dis 2017;21:1173-80. Song L, Wu X. Development of efflux pump inhibitors in antituberculosis therapy. Int J Antimicrob Agents 2016;47:421-9. Wilson ML. Rapid diagnosis of Mycobacterium tuberculosis infection and drug susceptibility testing. Arch Pathol Lab Med 2013;137:812-9. Coban AY. A new rapid colourimetric method for testing Mycobacterium tuberculosis susceptibility to isoniazid and rifampicin: A crystal violet decolourisation assay. Mem Inst Oswaldo Cruz 2014;109:246-9. Coban AY, Akbal AU, Uzun M, Cayci YT, Birinci A, Durupinar B. Evaluation of crystal violet decolorization assay for minimal inhibitory concentration detection of primary antituberculosis drugs against Mycobacterium tuberculosis isolates. Mem Inst Oswaldo Cruz 2016;111:454-9. Fonseca Lde S, Vieira GB, Sobral LF, Ribeiro EO, Marsico AG. Comparative evaluation under routine conditions of the nitrate reduction assay, the proportion assay and the MGIT 960 assay for drug susceptibility testing of clinical isolates of Mycobacterium tuberculosis. Mem Inst Oswaldo Cruz 2012;107:142-4. Kwak M, Lee WK, Lim YJ, Lee SH, Ryoo S. Systematic review and meta-analysis of the nitrate reductase assay for drug susceptibility testing of Mycobacterium tuberculosis and the detection limits in liquid medium. J Microbiol Methods 2017;141:1-9. Kumar K, Giribhattanavar P, Sagar C, Patil S. A rapid and simple resazurin assay to detect minimum inhibitory concentrations of first-line drugs for Mycobacterium tuberculosis isolated from cerebrospinal fluid. J Glob Antimicrob Resist 2018;12:157-61. Coban AY, Akbal AU, Uzun M, Durupinar B. Evaluation of four colourimetric susceptibility tests for the rapid detection of multidrug-resistant Mycobacterium tuberculosis isolates. Mem Inst Oswaldo Cruz 2015;110:649-54. Angeby KA, Klintz L, Hoffner SE. Rapid and inexpensive drug susceptibility testing of Mycobacterium tuberculosis with a nitrate reductase assay. J Clin Microbiol 2002;40:553-5. Coban AY, Birinci A, Ekinci B, Durupinar B. Drug susceptibility testing of Mycobacterium tuberculosis with nitrate reductase assay. Int J Antimicrob Agents 2004;24:304-6. Martin A, Portaels F, Palomino JC. Colorimetric redox-indicator methods for the rapid detection of multidrug resistance in Mycobacterium tuberculosis: A systematic review and meta-analysis. J Antimicrob Chemother 2007;59:175-83. Martin A, Paasch F, Docx S, Fissette K, Imperiale B, Ribón W, et al. Multicentre laboratory validation of the colorimetric redox indicator (CRI) assay for the rapid detection of extensively drug-resistant (XDR) Mycobacterium tuberculosis. J Antimicrob Chemother 2011;66:827-33. Palomino JC, Martin A, Portaels F. Rapid drug resistance detection in Mycobacterium tuberculosis: A review of colourimetric methods. Clin Microbiol Infect 2007;13:754-62. Farnia P, Mohammadi F, Mirsaedi M, Zia Zarifi A, Tabatabee J, Bahadori M, et al. Bacteriological follow-up of pulmonary tuberculosis treatment: A study with a simple colorimetric assay. Microbes Infect 2004;6:972-6. Farnia P, Masjedi MR, Mohammadi F, Tabarsei P, Farnia P, Mohammadzadeh AR, et al. Colorimetric detection of multidrug-resistant or extensively drug-resistant tuberculosis by use of malachite green indicator dye. J Clin Microbiol 2008;46:796-9.